The iPad Mini 3 with Touch ID was unleashed on the public on October 16th, 2014 at an Apple event in Cupertino, California. 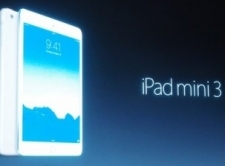 Apple, Inc. says it designed the iPad Mini to be a concentration, rather than a reduction of the iPad. The Mini 3 looks very similar to the Mini 2, but brings a few new components to the table that make it a slightly better device. Perhaps the most noticeable improvement with the iPad Mini 3 is that it now includes Touch ID. This fingerprint sensor security measure means that with one touch of the finger on the Home button the user can unlock the device. This Home button is made from sapphire crystal that is surrounded by a stainless steel ring. The Touch ID fingerprint technology has 360 degree readability, meaning that no matter which way the user turns the device, the Home button still reads the print. The resolution of the iPad Mini 3 with Touch ID is quite impressive, as it is even higher than that of an HDTV. With 3.1 million pixels, a 2048×1536 resolution display, and 326 pixels per inch (ppi), users were extremely happy with the video and game quality. There was a bit of disappointment expressed by the tech world that the iPad Mini 3 did not upgrade from the A7 processor with 64-bit architecture, but Apple claimed it is still plenty of power for gaming, videos, and high quality mobile technology. In addition to the A7 processor being unchanged from the iPad Mini 2, the Mini 3rd Generation still has the M7 motion coprocessor that measures motion from the accelerometer, gyroscope, and compass. The device has the 5 megapixel iSight Camera, which may seem a bit small when compared with the fact that the iPad Air 2 was released at the same time, but improved the camera to the 8 megapixel version. There are dual microphones with noise-reduction technology at the top of the device, and two built-in speakers at the bottom on either side of the lightning connector. The iPad Mini 3 with Touch ID now includes Apple Pay, which allows users to make one-touch purchases in iTunes, iBooks, and at the App Store. However, without the NFC (Near-Field Communication) chip, Apple Pay only enables these types of purchases and cannot process any of the day to day retail transactions that many people were hoping would be possible with the new technology. The NFC chip allows devices to trade data when an iPhone 6 with Apple Pay is held by the NFC monitor at time of checkout, and then Touch ID security can be used to complete the transaction. Without the NFC chip, purchases are limited to a small number of retailers. Before the launch Apple released tool kit updates so that app and web developers could make the most of the faster processing times in the new devices. However, most techies were disappointed that the iPad Mini 3 didn’t have as many software upgrades as they were hoping for, which meant that developers were not able to create significantly upgraded apps for this device. The engineers of the iPad Mini 3 attempted to make it a much more environmentally friendly device than its predecessor. As a result, the LCD display is mercury-free, the glass is arsenic-free, and the exterior shell for the device is recyclable. If the ecology-conscious specs of this device didn’t entice consumers, perhaps the new offering of a soft gold finish, (in addition to silver and space gray), did. Since both the iPad Mini 2 and the iPad Mini 3 have the same Apple A7 processor, we here at MacCasino.net believed that the best online casinos for The 2, would also be the best for The 3. After we concluded our research our initial thoughts were confirmed, and we therefore recommend the same online casinos for both the iPad Mini 2 and 3. Here are our top picks, broken down by geographic region. We have been impressed with the Slots.lv Casino software since it was launched a few years ago, and they are one of the best online casinos available in the USA today. Even though their name sounds like they are simply an online slots parlor, we can assure you that they also offer all of the most popular table games, video poker, keno, 3D slots, and scratch cards. Anyone wanting to gamble on an iPad Mini 3 in the United States will definitely want to try them out. The best option for online casino players in the United Kingdom who own an iPad Mini 3 is definitely the 32Red Casino, who have quickly become a favorite among gamblers from Aberdeen to Portsmouth. They have a huge selection of games, exciting slots tournaments, and even give away no deposit bonuses from time to time. 32Red also offers a huge poker room, mobile sportsbook, as well as an online bingo parlour, and everything is easily accessible through one account. We here at MacCasino.net know that Canadian gamblers are mostly concerned with the fluidity of games and not getting disconnected, so our choice for best Canadian casino is going to be very fast and never crash. We therefore proudly recommend the Bodog Casino for all of our friends living in Canada who want to bet on iPad Mini 3 and play casino games online. 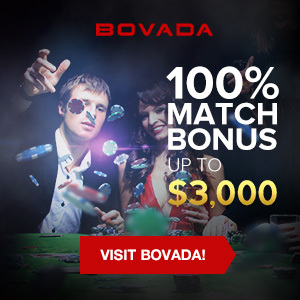 Bodog has excellent customer service, robust proprietary casino software, and great bonus offers throughout the year.